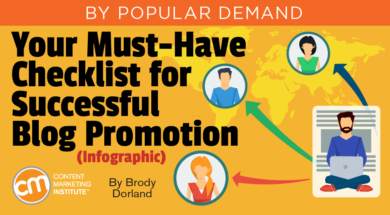 Editor’s note: Given ongoing demand for better content promotion, the author updated his earlier posts on blog promotion with this fresh checklist. Unfortunately, while you might like to click “publish” on a blog post and wipe your hands clean, savvy marketers recognize that the work is only beginning. Without an effective and repeatable process for promoting blog posts and maximizing their visibility, all the hard work spent creating them can easily go to waste. To help you with this component, I’d like to present a fresh take on a handy infographic that my team created in 2012, The Future-Proof Checklist for Promoting Your Blog Post, which you can find below in infographic and text form. While important, most of these actions are more procedural than creative, letting you reserve your brainpower for the blog post creation process. By following this checklist, which is customized to highlight today’s (and tomorrow’s) most impactful amplification techniques, you can be confident you’re doing all that is necessary to squeeze every last drop of juice from your content. Read it, save it, print it, pin it. Follow this blueprint consistently to make some noise with your content marketing. Identify a target keyword, plus several longtail variations, and populate them throughout your post. Run Google searches for these terms to learn about types of content already ranking. Use tools like BuzzSumo and Answer the Public to find out what’s trending socially around the topic. Write a meta description that accurately depicts what’s inside and compels a click. Draft an irresistible title tag that includes your target keyword. Crosslink to other relevant content within your post, leveraging keywords in anchor text. Develop a budget for paid reach on the channels used most by your audience. Draft several different sets of social copy for organic posts tailored to each network. Build relationships with influencers and thought leaders with authority around the post topic (outreach, social interactions, comments on blogs, etc.). Identify online communities, groups, or forums covering the subject area, and create a helpful presence. Use an RSS-to-email feature to automate blog post deliveries. Segment your subscriber list and target only groups relevant to the post topic. Write attention-grabbing subject lines, and A/B test to optimize. Make sure formatting is clean, simple, and (above all) mobile-friendly. Include links for recipients to share socially directly from the email. Publish organic posts with teasers, trackable shortlinks, and eye-catching images on your social networks of choice. Schedule several spaced-out posts to those same networks over the following days and weeks. Boost your best-performing organic promo posts through paid amplification. Reach out to influencers whose specialties tie to the subject and ask if they’d like to share (providing them with pre-written posts will make it easy for them). Include the social handles of experts mentioned or quoted in the post to get their attention. Share the post in relevant communities or groups where you’ve established a presence. Add a link to your email signature so it appears at the bottom of each message you send. Include the post in your company’s next newsletter. Write a guest blog post for a popular industry site and link back to your post. Share directly with high-value customers who are most likely to find the post useful. Link to your post on social bookmarking sites like Digg or StumbleUpon. Encourage coworkers to share in their networks. Monitor analytics vigilantly to determine which channels are driving the most traffic and invest more in top referrers. Switch your headline and/or imagery if the post isn’t gaining traction. Thank influencers and peers who shared your post; pay back the favor by sharing their content. Grow your personal brand to expand your network and find new readers. Creating an exceptional blog post is hard work. Don’t do it a disservice by failing to properly promote and amplify. Consistently following this checklist will ensure that your content doesn’t fall silently in an empty forest. Get more tips and insight on how to maximize your content at Content Marketing World Sept. 4-7. Register today using code BLOG100 to save $100.